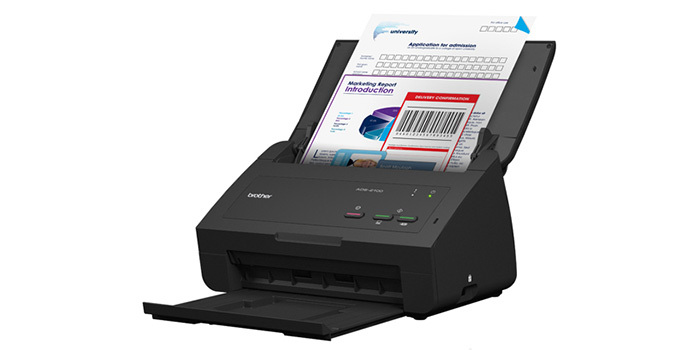 This summer’s novelty—a desktop document-scanner Brother ADS-2100—doesn’t make great impression from the first time. But it shows all its good sides from the closer view. Earlier, the Brother family of scanners was represented by DS-600 and DS-700D; both models belong to the other than the new one mobile and compact class of scanners. The new model aims for home and small office use and is customer-friendly easy-to-operate device. Push the button (more details can be found in the User’s manual on the DVD, which goes with the scanner, or on the official Brother site, not in the printed booklet, which is much handier). After the installation, a special app ControlCenter will help customize scanning to a PC and to a USB-flash options. The device has a compact design and intuitive interface; there are only 3 buttons and 2 indicators on the front panel (the buttons “Stop”, “Scan to USB”, “Scan to PC” and the indicators of power and occurred mistakes like paper jam). Directly to a USB-flash (bypassing a PC). Brother ADS-2100 won’t show all its potential during seldom home use and won’t cope with rather high stream mode, but it perfectly suits the needs of small office. Moreover, its price is very attractive (about $300), comparing with the closest competitors in the class—Canon DR-3010C, Canon imageFORMULA DR-M160 or Xerox DocuMate 150. This entry was posted on Tuesday, October 21st, 2014 at 7:52 am	and is filed under Brother. "New No Cartridge Epson Printers Already On The Shelves"
"EFI Innovative Ink Formula Changes Game Rules On The Soft Signage Market"